This morning when I woke Paisley up abruptly at 8. She jumped up with the biggest grin and called out, "Dada!" I played along with our little game and said, "I'm not Dada. I'm Mama!" She laughed and reached to climb out. I laid her on her bed for the routine diaper change and book perusal. She called Dada a few more times. I signed "all done" and she jumped up and took off down the hallway. "DA! DA! DA!" She searched our bedroom. She checked the bathroom and Jeff's closet. We went downstairs for breakfast and she sat in her chair chewing and calling, chewing and calling. After breakfast, her little feet slapped across the hardwood and she ran to the stairs that lead to Jeff's closet and yelled a few more DA's before peeking into the bathroom downstairs. Poor girl. She couldn't find her dada anywhere. 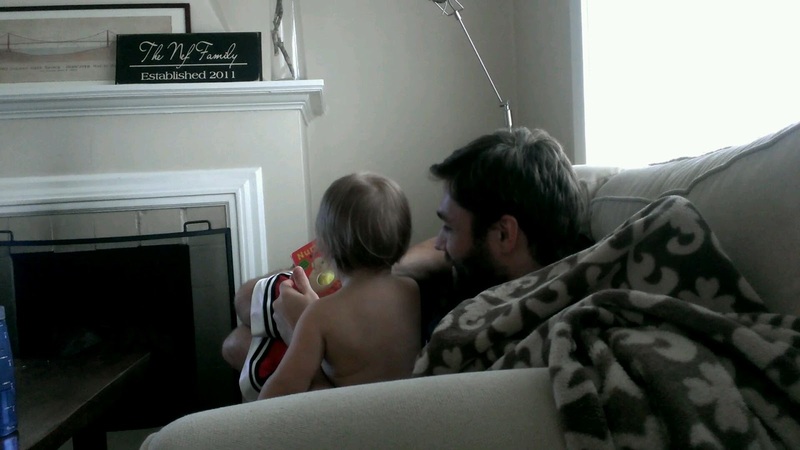 So we Skyped and she blew kisses and reached for her dada and went on her merry little way. Weekends just ruin this little daddy's girl.